Our recent releases make your content faster and more informative, so you and your clients get more out of every 3D Showcase. Engage viewers, connect multiple Spaces, and link to additional information or resources with links in Mattertag ™ Posts. Delight your audiences by giving them everything they need in a single place. See the Space below for sample Mattertag™ Posts with links! Download our White Paper for ideas on how to use links in Mattertag™ Posts across industries to enrich your Spaces. Visitors will understand the layout of a Space immediately with Labels. 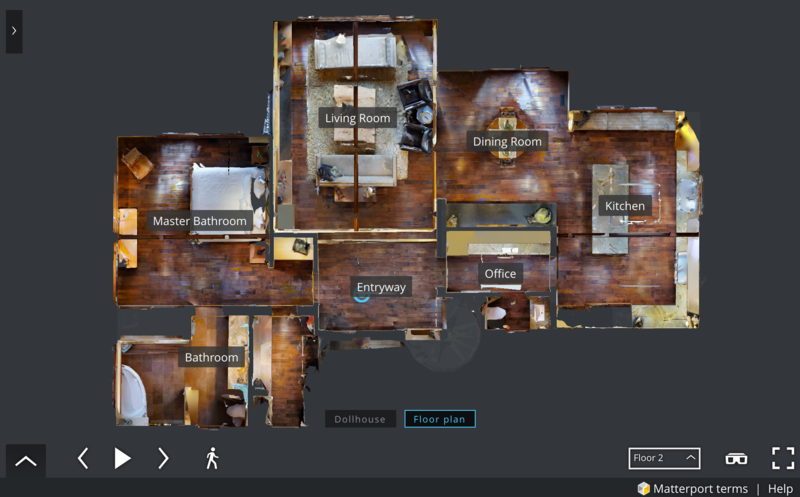 Now the names you give to rooms or areas within a Space can show up in 3D Showcase. Now visitors enjoy next-to-no delay when popping into a 3D Showcase. Quickstart - automatically applied to all Spaces - drops visitors into your Space so they can explore immediately. In a mobile-ready world where load times are key to engaging visitors and minimizing bounces and drop-off, Quickstart ensures your 3D Showcases work for you on the broadest range of devices and connection speeds possible. Quickstart has decreased Space load time by up to 50% on desktop, and up to 75% on mobile devices. Expect to see load speeds averaging 1.5 seconds on desktop, and 2 seconds or less on mobile devices.